The BCOER Librarians have developed a useful guide to assist faculty with the open textbook and OER evaluation process. This Faculty Guide for Evaluating Open Education Resources has been released under a CC-BY 4.0 International license. Feel free to print as many copies as you need for evaluating open textbooks. Evaluate an Open Textbook by Lauri M. Aesoph is licensed under a Creative Commons Attribution 4.0 International License, except where otherwise noted. The <a target="_blank" href="https://open.bccampus.ca/bcoer-librarians/">BCOER Librarians</a> have developed a useful guide to assist faculty with the open textbook and OER evaluation process. This <a target="_blank" href="https://opentextbc.ca/adaptopentextbook/wp-content/uploads/sites/144/2016/06/Faculty-Guide-22-Apr-15.pdf">Faculty Guide for Evaluating Open Education Resources</a> has been released under a <a target="_blank" href="https://creativecommons.org/licenses/by/4.0/">CC-BY 4.0 International</a> license. Feel free to print as many copies as you need for evaluating open textbooks. The <a target="_blank" href="https://open.bccampus.ca/bcoer-librarians/">BCOER Librarians</a> have developed a useful guide to assist faculty with the open textbook and OER evaluation process. This <a target="_blank" href="https://opentextbc.ca/adaptopentextbook/wp-content/uploads/sites/144/2016/06/Faculty-Guide-22-Apr-15.pdf">Faculty Guide for Evaluating Open Education Resources</a> has been released under a <a target="_blank" href="https://creativecommons.org/licenses/by/4.0/">CC-BY 4.0 International</a> license. Feel free to print as many copies as you need for evaluating open textbooks. The <a href="https://open.bccampus.ca/bcoer-librarians/">BCOER Librarians</a> have developed a useful guide to assist faculty with the open textbook and OER evaluation process. This <a href="https://opentextbc.ca/adaptopentextbook/wp-content/uploads/sites/144/2016/06/Faculty-Guide-22-Apr-15.pdf">Faculty Guide for Evaluating Open Education Resources</a> has been released under a <a href="https://creativecommons.org/licenses/by/4.0/">CC-BY 4.0 International</a> license. Feel free to print as many copies as you need for evaluating open textbooks. The <a target="_blank" href="https://open.bccampus.ca/bcoer-librarians/">BCOER Librarians</a> have developed a useful guide to assist faculty with the open textbook and OER evaluation process. This <a target="_blank" href="https://opentextbc.ca/adaptopentextbook/wp-content/uploads/sites/144/2016/06/Faculty-Guide-22-Apr-15.pdf">Faculty Guide for Evaluating Open Education Resources</a> has been released under a <a target="_blank" href="https://creativecommons.org/licenses/by/4.0/">CC-BY 4.0 International</a> license. 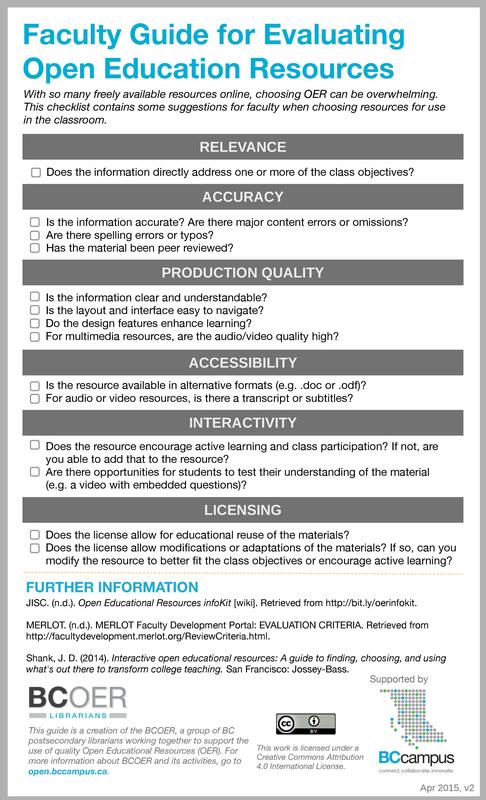 Feel free to print as many copies as you need for evaluating open textbooks.